Today, I’m going to take a break from my usual run of topics and just write about the most delicious foods I’ve eaten abroad. 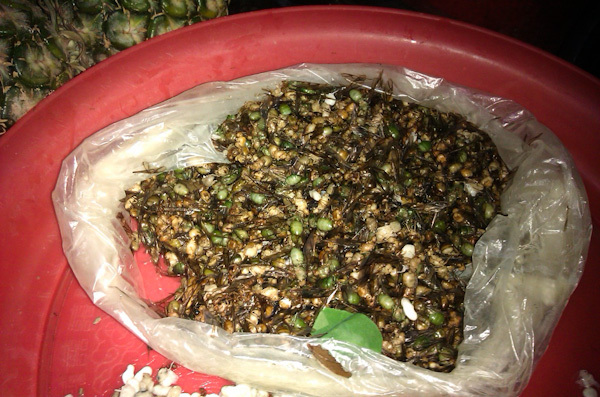 Although I’ve indulged in some strange things on the road, from roasted Peruvian guinea pig (cuy) to munching on Cambodian crickets, I’ve discovered that the most delicious foods are actually pretty common fare. However, I am going to exclude deep-fried foods on my list. I’ve had my fair share of international deep-fried delicacies, whether it be deep fried pork rinds cooked in an oil drum in Chihuahua, Mexico or Rántott Camembert, Hungarian deep-fried Camembert cheese accompanied by mayo dip served on a bed of fries, which as the heart attack inducing description suggests, should only be a once-in-a-lifetime experience. As one might expect, all the above don’t differ much from the typical carnival run of artery cloggers back at home – deep-fried butter, deep-fried mars bars, deep-fried mac & cheese – or just plain old french fries. These days, it seems that everyone is discovering that deep frying (or adding bacon) seems to make everything delicious, but I beg to differ in my list. Note that the list is biased as I don’t really have a sweet tooth, so all those New York cupcake joints and Mexican churros street carts won’t make the cut. I’ve also gone vegetarian in recent years, so there might be less meat dishes on my list. As always, I welcome new additions in the comments, because I’m sure I’ve missed a lot. Without further ado, here’s what I remember as pretty darn tasty from my travels. Tom Yum Goong (Thailand) – A whirlwind of sweet, sour, umami, and definitely spicy flavours in one gulp, this yummy soup (no pun intended) really packs a tantalizing punch with each spoonful. Vegetarians, the mushroom version is just as good. Paneer Makhani (India) – Most people either think of Indian food as really spicy or stick to butter chicken, which is everywhere albeit rightfully popular if done well. Since I’m a vegetarian, I prefer paneer makhani, which uses cheese cubes instead of meat. Sometimes, it’s the same masala sauce as butter chicken or chana masala (chick peas), though I’ve had versions of the tomato-based cream sauce that’s sweeter and not as spicy. Tapas (Spain) – I’m being a bit general here, because tapas can include anything since it’s really a bunch of small dishes, making it much like Chinese dim sum or Japanese izakaya. As such, the quality can vary dramatically among restaurants, but if you find the right joint (usually the tapas aren’t rolling around a conveyor belt, a la Japanese sushi-style), it’s a real treat! Pad Thai (Thailand) – Easily found on street stalls outside Bangkok’s malls or anywhere street-side Thailand for that matter, Thailand’s pad thai is not the fast food ketchup-y noodles we usually encounter back at home. The vegetarian version is just as great as the uber-popular chicken pad thai. The best part? 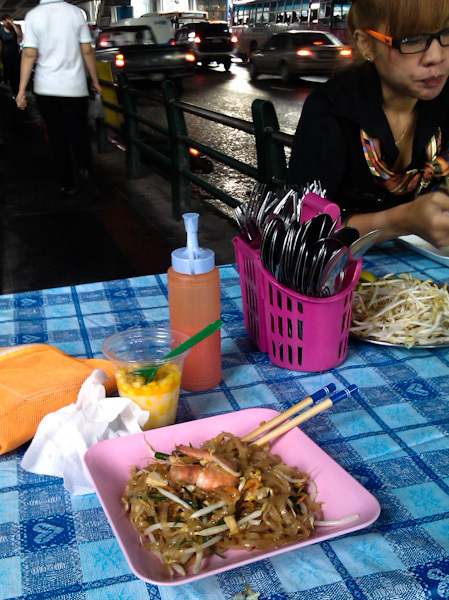 I got to share my busy roadside table with a lady boy in Bangkok, for a crème de la crème Thai experience. Har Gow (Hong Kong) – Chinese dim sum, or the bit-sized dishes served morning to noon, is much like Spanish tapas. The most popular dish probably has to be har gow (shrimp dumplings). This one by far was my childhood fave. I could list a ton of other dim sum dishes as my faves, but if I was introducing someone to the cuisine, har gow would be come first. Siu mai, pork and shrimp dumplings often served alongside har gow, would probably be a distant second. 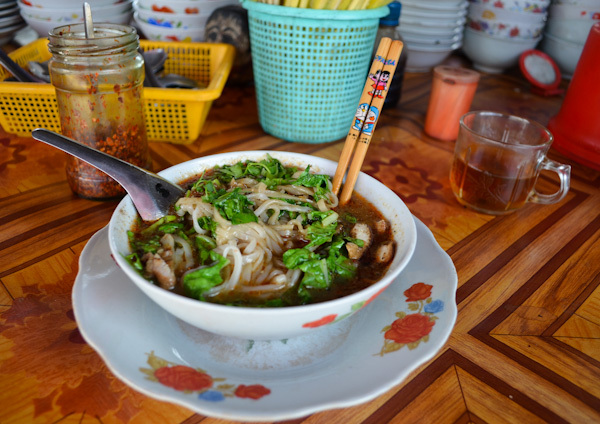 Pho (Vietnam) – pronounced “Fuh” and not commonly mistaken “Foe”, the slow-cooked broth of this Vietnamese noodle soup tastes like it’s been made with patient, loving care. In fact, it takes so much time, that most Vietnamese opt to eat out whenever they get the pho craving. You should too. Don’t cut yourself short an order just the beef ball version. The house special with all the trimmings is the way to go. Fortunately, if you live in a city with a large Vietnamese population, this is one dish that is typically done well by at least one restaurant. 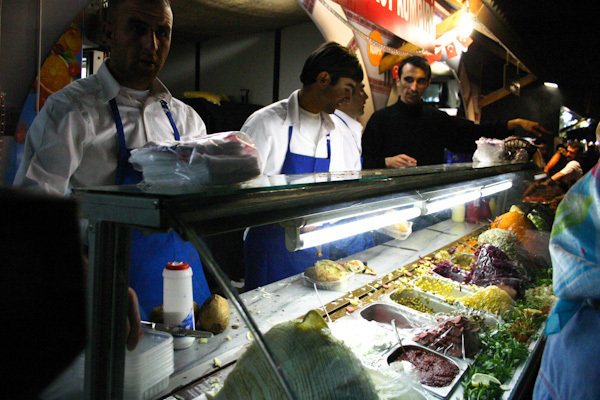 Iskendar Kebap (Turkey) – This was the standout dish for me when I travelled in Turkey. I believe Kayseri has an excellent restaurant specializing in Iskendar Kebap, though I missed out on it since I went during Ramadan and spent my nights hanging out in a mosque with locals. Fruit Shake (Thailand) – If there’s one way to escape the heat in Thailand aside from ducking into an air-conditioned mall, it would be to grab a fresh fruit shake off the street. Exotic fruits such as durian, soursoup, dragon fruit, avocado, and jackfruit are abundant and local to boot. Durian, which has a smell and flavour not loved by all, is actually more palatable in a fruit shake form. I might just be putting this one on the list because of it’s relative delight in the searing heat, or the fact that at Thai prices, I can afford to drink them all day long. Steamed Garoupa (Hong Kong) – Fish is usually seared in a pan or baked in an oven most places I go, but in Hong Kong, it’s steamed in a wok. The result is a surprisingly moist, melt-in-your-mouth dish that will have you craving it again within an hour. Pastrami Sandwich (New York City) – Pricey but tasty, the moist, thick, and flavorful pastrami served in New York’s delis is completely unlike the mundane, tasteless supermarket pastrami I grew up with. Since most of us pass by New York at some point in time, this one’s the easiest one on the list for you to try yourself. Montreal Smoked Meat (Montreal, Canada) – Rightfully popular, Schwartz’s Delicatessen in Montreal constantly packs a line, even in the middle of a frigid Quebecois winter. It’s less than half the price of the above mentioned pastrami sandwich in New York City, but equally good. Tip: Get takeout and enjoy your meal in the nearby Saint Louis Park if you have the option. Banh Mi Sandwich (Vietnam) – Sure, they’re not as great as the above two sandwiches, but for only a buck or two a pop, these tasty subs are typically served on a crunchy french baguette with fresh trimmings. Tip: spicy is more like painfully hot. If done traditionally, banh mi’s heat comes not from chili sauce, but actually sliced-up fiery chili peppers, seeds in. Sushi/Sashimi (Japan) – A hallmark of Japanese cuisine that everyone knows about. There’s a huge selection and variety in Japan, including the live, moving octopus. 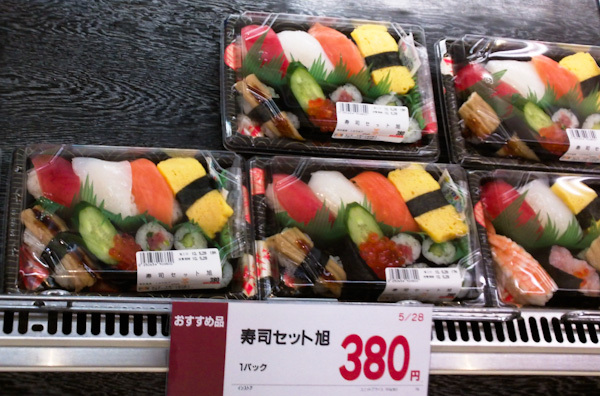 It’s also surprisingly cheap in Japanese supermarkets – at the time the below photo was taken, 380 yen was about $4. American BBQ (USA) – Tip: the sign of a good BBQ place is one that makes a limited amount of barbecue items per day When they run out, they run out. This means they’re truly slow cooked and fall-off-the-bone. Although I don’t eat meat anymore, I can appreciate the cooking process, which tenderizes while infuses flavour into the meat. Try the burnt ends if they’re available. I favor the BBQ scene around Kansas City, but good BBQ can generally be found elsewhere if you look hard. Banchan (Korea) – I think at this point, it’s safe to say I like lots of different food served in tiny portions (dim sum, izakaya, tapas). Banchan, the small side dishes served with Korean meals or as bar snacks, is no different. Also, unlike a lot of Korean food, it’s vegetarian… and really tasty to boot! Ramen (Hokkaido/Osaka, Japan) – Ramen served in a ramen shop is vastly different from the instant noodle variety most of us devour when needing a deceivingly quick hunger fix. Unfortunately, I usually find fresh ramen rather salty due to heavy soya sauce or miso use in the broth. 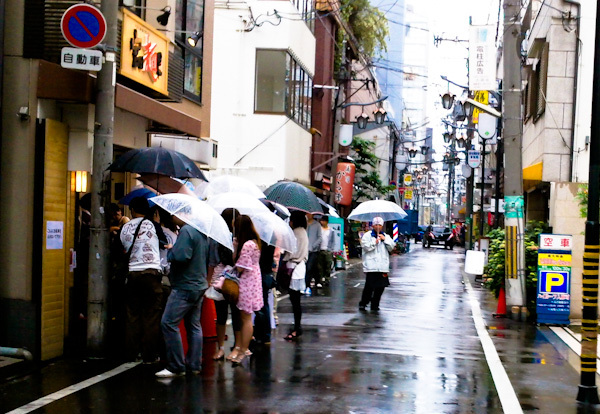 However, I lined up for an hour in the rain to get in the below Osaka ramen shop. It was there that I discovered my favorite ramen, made with fresh noodles served separately in an unsalty but delicious vegetable broth. Definitely worth the wait. Curry Fish Balls (Hong Kong) – Hong Kong street food is some of the best in the world, though health regulations have since forced the vending carts off the streets and into cramped street-level building stalls. 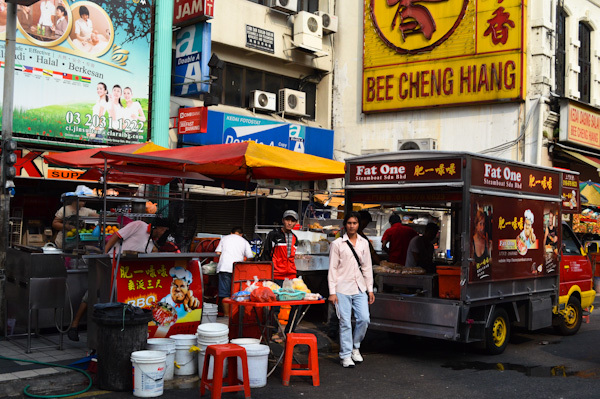 Though stinky tofu is more well-known because of it’s off-putting smell, curry fish balls are the most popular street snack in terms of sales, popularity, and the “being-allowed-into-buildings-ness”. Bagels (Montreal, Canada) – I’m actually not a fan of bagels. There, I said it. I find them chewy and bland, while stealing the flavor from whatever spread I’ve topped them with. Fresh-baked bagels in Montreal, however, are different. Wow. I could just eat them straight. I might never eat regular bagels again. Vegetarian Izakaya (Kyoto, Japan) – Izakaya is a type of Japanese that serves beer and tapas-like food. 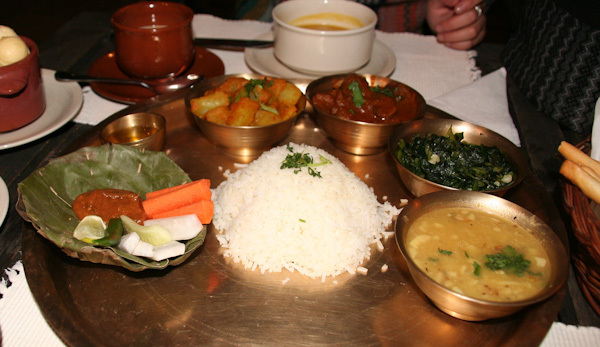 The quality of the food really varies, depending on the purpose of the restaurant. Usually, the more focused the bar is on drinking, or if the restaurant is cosplay or dungeon-themed, the sh*ttier the food. Kyoto, however takes the regular bar-style izakaya to the next level. In fact, because it seems to have a reputation to uphold, Kyoto seems to excel in everything, but most notably its vegetarian cuisine. Although not cheap, the vegetarian izakaya I had in Kyoto was fresh, creative, and a memorable experience. Turkish Chicken Kebap (Germany) – Strange, isn’t it? Turkey has great kebaps, but the exported portable German version on a pita really impressed me. Or maybe I just lucked out when I stumbled in the Turkish quarter in Cologne, Germany. 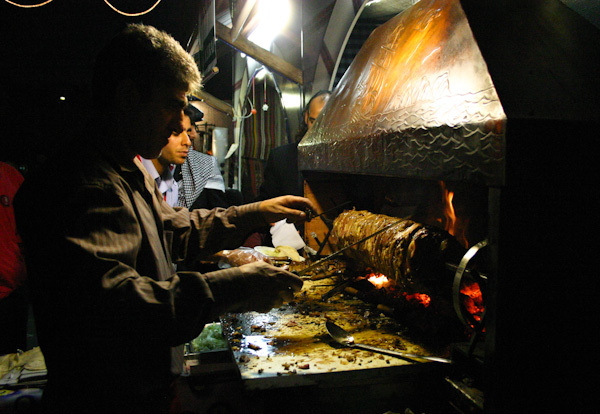 I think the trick with a good kebap is one where the meat is carved off the rotisserie at the right moment, when it’s most tender. Gniocchi (Florence, Italy) – I’m not a huge pasta fan, but I once went on an eating spree in Florence because I was so dazzled by the texture of the gniocchi there. It’s really good. Green Curry (Thailand) – Man, Thailand keeps coming up in this list, and rightfully so! Going beyond other curries and not just offering heat, green curry simultaneously has taste and kick. The curry in the neighboring countries of Cambodia and Malaysia are also pretty amazing too. Ceviche (Peru) – The beauty of ceviche, like most regional foods, is that it varies across the country. Try a fancier plate in the capital Lima, and then hit back a cheap platter up in the simple fishing/surfing town of Mancora. Takoyaki (Japan) – Particularly adored in the Kansai region of Japan, these octopus balls come fully loaded with all sorts of Japanese toppings. 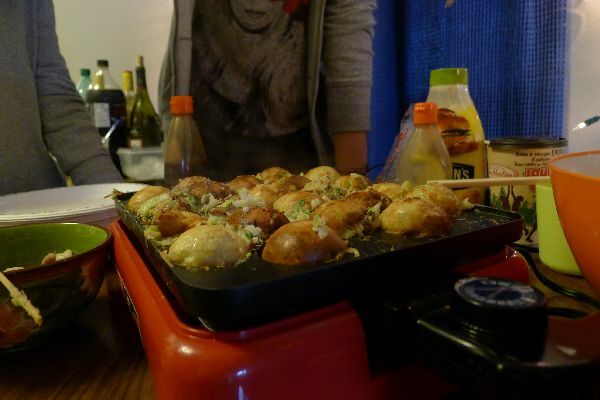 I loved takoyaki so much, I brought back a takoyaki machine so I could make them at home. Okonomiyaki, a similar tasting pancake dish also hailing from the Kansai region, is also rightfully popular, but if I had to choose between the two, I’d go with takoyaki. I think the ball shape won me over – they’re just so cute looking! Peking Duck (China) – This is a Chinese classic. If you haven’t tried it before, go out and try it now, even if your only option is your local Chinatown. Street Dogs (Toronto, Canada) – Finally, something from my hometown – hot dog or sausage served from a street dog cart. Incredibly satisfying on a cold winter day, Toronto “street meat” vendors also usually offer a nice variety of toppings, condiments, and ethnic sauces to dress up your dog. The veggie dogs aren’t half bad either, if you don’t eat them too often. I’d also like to add that the beauty of Toronto is that it’s such a diverse multicultural city, so that much of the food I’ve listed above is done pretty authentically somewhere in the city. Ethiopian sourdough, cold pizza in Rome, Sichuan dandan noodles, Polish borscht, French onion soup, Canadian poutine (it’s deep-fried), Swedish meatballs, Scandinavian smoked gravlax (salmon), any hot lodge food served while trekking in Nepal, Malaysian yellow curry (probably would have been on the main list, but I got sick in Malaysia). Sticking to the holy trinity of foods on the backpacker trail: fried rice, banana pancakes, and spaghetti. The only thing worse is going on an international “tour” of McDonald’s restaurants. Tip: I’ve been told it’s pretty much the same-tasting crap, wherever you go.